Guest Rev. 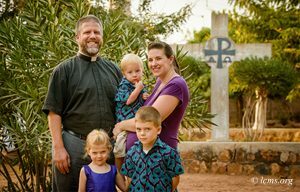 Micah Wildauer, along with his wife Robin, serve the Lord as career missionaries through The Lutheran Church—Missouri Synod (LCMS) in Togo. In this role, Micah teaches courses in Lutheran theology at The Centre Luthérien d’Etudes Théologiques (CLET), or Lutheran Center for Theological Studies, in Dapaong, Togo, West Africa. CLET is the seminary of the Lutheran Church of Togo (ELT). He also teaches some distance learning and continuing education courses throughout Francophone West Africa as needed. In addition to his teaching responsibilities, he coordinates visiting professors to CLET. Read more about their story and how to support them at lcms.org/wildauer, and learn how you can serve as a missionary at lcms.org/service.